April 06, 2019: When it comes to taking care of your daughter’s hair, oiling hair regularly is the go-to choice of all mothers. Making an informed choice is a tough one as it involves the hair of your little one. So what do you do? Children’s hair is quite delicate and fine so it is important to find the right products for children to use and build up a hair care routine that works with your child. An important fact to note is that the texture of a child’s hair is different from an adult and thus has different requirements. As children are very active and love to play games, their hair is susceptible to sweat and dust which can easily cause dryness. Frequent oiling increases the blood circulation and provides moisture to the scalp. The best option is to use nourishing ingredients you are familiar with like almonds and olives. These are not only superfoods but the oils extracted from them are great for the health of young hair. What if there was a special hair oil made only for your little angel’s hair? 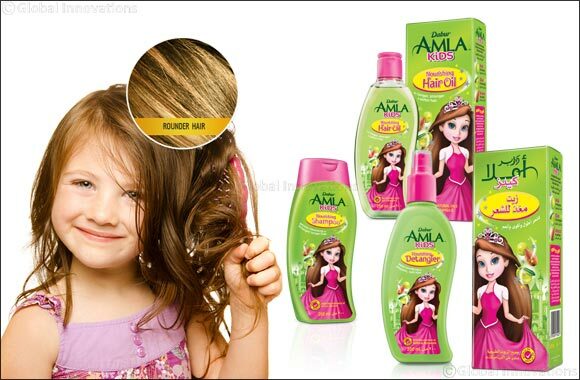 The secret to longer, stronger, softer hair for your kids is now out with especially formulated Dabur Amla Kids Hair Oil - let your little princess's hair grow with natural extracts of sun kissed olives, rich almonds and Indian gooseberry, among other herbal extracts. Dabur Amla Kids, made from 100% natural oils is a special formulation that contains nourishing ingredients to make your kids hair soft and smooth. Amla is known to nourish the scalp and hair, olive makes the hair strong while almonds make it soft. The oils’ special complexes nourish your kids’ hair, makes them soft and adds shine. The oils are also paraffin-free, which reassures Moms that their children are safe from harmful chemicals. A good massage with Dabur Amla Kids Hair Oil before every shampoo will ensure that your child develops strong roots and long healthy hair. It is easy to wash yet the pleasant fragrance stays longer in the hair while keeping it soft. The new Dabur Amla Kids Nourishing Detangler makes hair combing easy and saves you the pain of pulling your kids hair while combing. In addition to making the hair longer and stronger, Dabur Amla kids range also provides the shimmer and shine that every little princess wants.